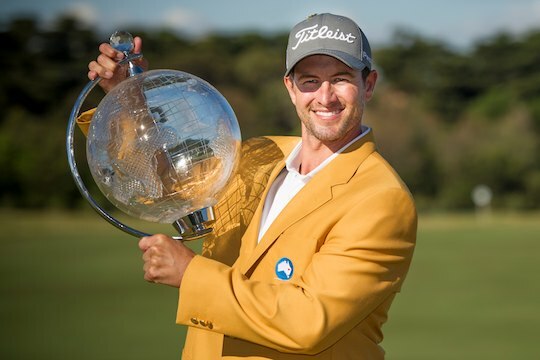 For the first time in his career, Adam Scott has secured back-to-back victories following his two stroke win at the Australian Masters in Melbourne over American Matt Kuchar. Scott began the day at 14-under, leading by four shots over Vijay Singh and Australians Nathan Holman, Nick Cullen and Matthew Griffin. Kuchar was a further shot back at 9-under. Scott experienced a mixed start to his round, saving par on the par-five second and birdieing the third to go to 15-under, increasing his lead to five shots. But bogeys at the fifth and seventh – broken up by a birdie on the sixth – halted the world number two’s momentum and opened the gate for challenges from Singh and Kuchar. “Sometimes you win a bit ugly,” said Scott. Kuchar also had a tough start to his round with a bogey on the second, but he then reeled off five birdies in seven holes to shoot 31 for the front nine. Singh put pressure on Scott, with the Fijian 3-under for the day over the first six holes. However consecutive bogeys on the seventh and eighth put him back off the pace. Ultimately, this championship came down to the 18th as Kuchar’s approach hit the lip of the bunker and spun back into a terrible lie deep in the thick stuff on the tongue of the bunker. At the time, Kuchar held a share of the lead with Scott and a play-off looked certain. The American was forced to chip sideways, and ended up with a double-bogey six to all but hand the title to Scott. Scott then parred the last to complete the emotional victory. “Starting four in front was enough to get across the line,” said Scott. Scott will spend the rest of the week in Melbourne preparing for the World Cup, starting Thursday at Royal Melbourne, before playing the Australian Open in Sydney. When asked about the changes of the ‘Australian Slam’ – a feat last achieved by Robert Allenby in 2005 when he won the Australian Masters, Australian PGA and the Australian Open – Scott was quietly confident regarding his changes. “Certainly it’s on my mind,” said Scott. Vijay Singh finished in third position at 10-under, with opening round leader Nick Cullen finishing at 9-under and outright fourth.